The Ford-4D thermostat is hand assembled from components made by your OEM supplier. It also has the same size diaphragm and proper bypass control so you are guaranteed maximum efficiency from your cooling system. 100% made in USA. Whether you are using an aftermarket radiator or not, this thermostat will provide the best possible heat dissipation from your setup and even deliver better overall performance than our competitor's 160° thermostats. Reische believes the 170° opening temp is the ideal balance for high performance engines, providing high flow to your radiator by mid-180 temps along with good all season performance. With proper fan settings your coolant temps in cool weather will be in the 170s and in hot weather the 180s, giving those running high levels of timing and/or boost added protection against engine-damaging detonation as well as maximum hp. 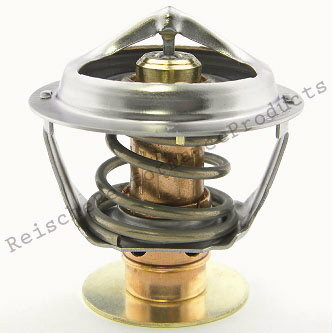 All Reische Performance thermostats ship with an OEM O-ring and are backed by a 5 YEAR WARRANTY. This thermostat fits many more vehicles- if you are unsure if this product fits your application then find your vehicle's Motorcraft thermostat (RT #) and use our Motorcraft Thermostat Cross Reference in our Application Guide. Ideally the fan settings in your tune should be lowered to see the best possible heat dissipation from your cooling system. Otherwise a low temp thermostat will only be effective when the vehicle is moving because heat cannot be removed unless there is air passing through the radiator. However, there is not a handheld programmer available at this time capable of modifying fan settings in most of the new Ford engine management systems. The fan speed tables will need to be adjusted through a custom tune (available from most of our vendors) or via tuning software. These new systems estimate coolant temps based on readings from a dry head temp sensor. However these ‘inferred’ ECT values can be more volatile and may read as much as 8-10° hotter than actual coolant temps. This means that a vehicle using our 170° thermostat could see ECT anywhere between 165-205°, depending upon conditions and fan settings. We rely on your feedback, so please let us know if you become aware of any new developments in managing the fan settings for these applications. Copyright Reische Performance Products © 2018. All Rights Reserved.